Born in Naples, Italy in 1954, Pasquale Verdicchio was raised in Vancouver and Victoria, British Columbia. He began publishing in his early 30s with Moving Landscape in 1985, published by the Canadian press, Guernica. Guernica also published his second major collection, Nomadic Trajectory in 1990 and Approaches to Absence four years later. His most recent collection, The House Is Past, was published by the same press in 2000. In 1986 Verdicchio became a professor of literature and writing at the University of California, San Diego. 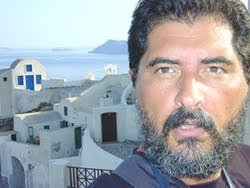 He has published several translations of Italian poets, including Antonio Porta, Giorgio Caproni, Pier Paolo Pasolini, and Alda Merini, and edited a small publishing series, Parentheses Writing Series. More recently, he has headed a program in Italy for the university. I rest in the dark. hours become more and more difficult. A photograph and your smile. your breasts in Mediterranean water. line in equilibrium, profiles of animals. for the collection of space. never a body doubtless a disguise. Certain confusion pulls events over your eyes. Do you want to talk. The field narrows as the evening progresses. Daughters maybe sons are waiting. come toward a more palpable prayer. which halt the grip of occasion. There are ears in the fields. An easel placed in one corner speaks volumes. by no means sacred to all. Easy to recognize even through voices. Use an already existing quote. Only hours away in retreat. Talk of the town circles back. Someone is taking things into their own hands. A practical consideration: the answer is no. not of the comic sort. in a trance the pain ceases. Culture is a matter of subtraction and offering. touch razor sharp icons and sacrifice. on the illusion of its invisible pressure. fall as shadows over the sight of believers. that colour the permanence of childhood. it’s too late to talk. The patron saint of politicians? A young couple meets. Obviously the man cannot be trusted. The building is very high and the fall proves acceleration. Varying angels are clever devices. It could be any city on the east coast. But the skyscrapers serve as a hint. The reflection of the sky and surrounding walls in her eyes as she falls. There are no friends who could witness. There are no souvenirs to speak. Of letters it’s the same. A fast track affair. A question of errors along the way. Sooner or later he will make a mistake. He will surely fall for himself. He will most likely do so on purpose. Set the trap and activate it. No one will believe it. He will tell everyone he set himself up to fall. Or maybe he should just go on as he is. Why should I make it easy, he thinks. A clever fellow, he assumes another identity. The new self suits him better than the old. He has erased his family and himself. No one will miss him, he is certain. Time passes. An effigy is something someone else constructs. It can be specific or general. He is not an effigy of himself. An effigy is headed toward destruction. He is headed in the opposite direction. He wakes up at night in a cold sweat. There are whispers. The same whispers he hears every night. He walks to the mirror and stares back at himself. All right, he thinks, there is no kidding you. He wakes up in the morning not knowing how he got back to bed. Maybe the voices are only a dream. The last thing he remembers is refusing to answer. that he is afraid to call her just in case the story is not just a story but is a true and actual event. He decides to explain it to himself later. There is another lapse of memory. This time from a bridge. A Pythagorean displacement. A body in a body of water. One body replaces another in his actions. He does not know if these are his actions. The story takes a turn. It is someone else he remembers. The turn is too sharp and the bakes fail. The new body is trapped in the flaming wreck. This body, and the bridge body, and the body of initial falling are related. His obsession is clear but without reason. There are no examples that he can think of and none that he can use as a lie. He resigns himself to a bodily accumulation. An average person in an average situation. Reprinted from Ipsissima Verba (San Diego: Parentheses Writing Series, 1986). ©1986 by Pasquale Verdicchio. Reprinted by permission of the poet. Reprinted from Isthmus (Los Angeles: Littoral Books, 1991). ©1991 by Pasquale Verdicchio. Reprinted by permission of the poet. Reprinted from Approaches to Absence (Toronto: Guernica, 1994). ©Pasquale Verdicchio and Guernic Editions. Reprinted by permission of Guernica Editions.